MIDDLEBURY, Vt. – The best collegiate skiers in the country will receive the red-carpet treatment next week when they arrive in Middlebury for the NCAA men’s and women’s Alpine and Nordic skiing championships, March 6-9. Skiers from as far away as Alaska, New Mexico, Utah and Colorado, and from as close by as UVM, Harvard, St. Lawrence and Williams will start arriving in Vermont over the weekend, and will begin practicing at the Middlebury College Snow Bowl and the Rikert Nordic Center on Monday, March 4. But the planning for the four-day event began in 2009 when Middlebury College submitted its bid to host the NCAA championship for the fifth time in history. (Previous years were 1961, 1973, 1988 and 2001.) And some might even say that the college started preparing to host the 2013 nationals as far back as 2006 when the Snow Bowl undertook widening and contour improvements to the Ross and Allen Trails. Since that time, the college has replaced the chair lift on Worth Mountain where the slalom and giant slalom events will take place; constructed a five-kilometer “homologated” race course at the Nordic center to meet international standards for width, climbing levels and total elevation; added fiber-optic cable at the Snow Bowl for improved communications services; and, most recently, installed at Rikert the most extensive snowmaking system of its type among all of the cross-country skiing areas in North America. But getting ready to host the nationals takes more than skiing facilities, snow and favorable weather. It also requires the host school to handle hundreds, if not thousands, of details like lodging, dining and meeting space for athletes, coaches and NCAA officials. The skiers need access to training rooms, ski waxing and sharpening equipment, and medical personnel. Members of the media expect high-tech telecommunications capacity and up-to-the-minute results and statistics. And then there are essentials like snowmaking, grooming, transportation, timers, security, banners, bibs, signage, parking permits, safety checks and everything else that goes into hosting a national skiing championship. The responsibility for getting all the details right has fallen on the shoulders of Middlebury College’s Alpine coach Stever Bartlett, Nordic coach Andrew Gardner, athletic director Erin Quinn, athletic facility coordinator Franklin Dean-Farrar, Snow Bowl director Peter Mackey, Rikert director Mike Hussey, and the former director of skiing at Middlebury, Terry Aldrich, who is the championship director. In addition to the regular staff in Ripton at the Snow Bowl and Rikert, and back on campus in the Peterson Family Athletics Center, it takes dozens of volunteers to ensure the safety of the athletes and spectators, and guarantee the efficiency of each day’s events. Both the Alpine and Nordic events will be free of charge and spectator-friendly. In addition, all of the races at both venues will be broadcast live on the Web. To watch the webcast, or for a complete schedule of the four-day event, go to http://www.middlebury.edu/athletics/sports/skiing/ncaa13. At the Snow Bowl, a 15-foot-wide video board (described as a “Jumbotron”) will display the races, and spectators situated near the base lodge will have a direct line of sight to watch the racers ski down the lower half of the mountain. Two-time Olympian Doug Lewis from Waitsfield, Vt., will provide expert commentary for the Alpine events, both on the webcast and to the live audience. For the Nordic races at Rikert, four video cameras will be set up along the course to feed the webcast while spectators will have plenty of live action to watch. The way the course is set up, people watching the 10-kilometer classic race, for example, will be able to see the skiers in person at the start, at the 2.5-kilometer mark, at five kilometers, at the 7.5-kilometer mark and at the finish, in addition to hearing the expert commentary over the PA system. Alpine events begin on Wednesday morning, March 6, with the men’s and women’s giant slalom races on the Allen Trail. Nordic takes over on Thursday morning, March 7, with the women’s and men’s classic races. Alpine resumes on Friday morning, March 8, with the men’s and women’s slalom races on the Ross Trail, and the championship will culminate on Saturday morning with the women’s 15-kilometer freestyle race followed by the men’s 20-kilometer freestyle race. Nine Middlebury students qualified for the nationals and will ski for the Panthers. In Alpine they are: David Donaldson ’14 from Toronto, Andrew McNealus ’13 from Woodstock, Vt., Hig Roberts ’14 from Steamboat Springs and Mary Sackbauer ’15 from Vail. The Nordic skiers are: Austin Cobb ’14 from Peru, Vt., Ben Lustgarten ’14 from Burlington, Vt., Heather Mooney from Peru, Vt., Kelsey Phinney ’16 from Boulder and Annie Pokorny ’15 from Spokane. Not only are most lodging establishments booked to capacity (with the Middlebury Inn designated as “race headquarters,”) but restaurants, shops and other attractions should experience an uptick in business due to the influx of skiers, coaches, officials and spectators. “The local merchants I’ve spoken with are very excited about how many people are coming to our region for the championships,” Aldrich added. 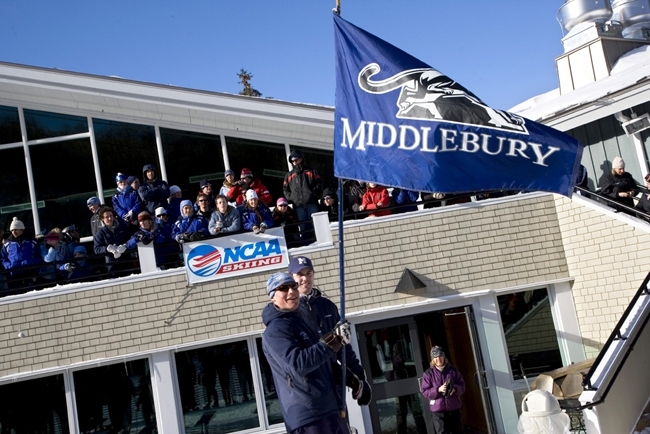 Hosting the NCAAs has another benefit too, one that accrues to Middlebury College and to the college-owned ski areas.